To this reviewer, it seems like we’re having a bit of a cultural moment, confronting issues of racism and sexism on a national level. In the publishing industry, organizations like VIDA and Cave Canem are making space for diverse voices and calling on more privileged individuals to sit down and listen. This is a good thing for readers whose options are growing as well made and challenging books are brought to the fore. Back in August I reviewed Jamaal May’s Hum and wrote a little bit about how our reading is almost always affected by the world around us. I finished reading May’s book when protests in Ferguson began and, shortly after reading Claudia Rankine’s Citizen: An American Lyric the #Pointergate scandal hit and I found myself rereading Rankine’s words in light of yet another story with systemic racism at its core. I’m reading within this cultural moment, which has altered my reading list in profound ways. Citizen contains a series of vignettes describing, in second person, various microaggressions—subtle, perhaps unintended, displays of power by white people toward people of color. The real estate woman, who didn’t fathom she could have made an appointment to show her house to you, spends much of the walk-through telling your friend, repeatedly, how comfortable she feels around her. Neither you nor your friend bothers to ask who is making her feel uncomfortable. Rankine pulls news stories into these vignettes as well, referencing Don Imus, who notoriously insulted the Rutgers University women’s basketball team, and men (boys in the case of the last two) like James Craig Anderson, Trayvon Martin, and Jordan Davis whose tragic deaths were racially motivated. This is poetry as documentary, as news story. At worst, poetry like this can feel dated, but Rankine has a knack for highlighting the stories that need to be remembered and turning them on us so that we see them differently. As a white man, the experiences of people of color are and always will be beyond my abilities to understand. Rankine, however, provides a window into a world I have the privilege of knowing nothing about. Rankine puts the reader in the spotlight, making us see these stories anew, as a way to cast these aggressions from her body. It’s a tactic that is potentially triggering to someone who has experienced aggressions like this, but is a way to discomfort the comfortable. 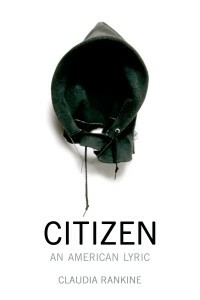 Beyond the content, Citizen is formally compelling as well, though very much in the tradition of American letters, as the subtitle alludes to. Split into seven parts, the book has no table of contents and only a single section features titled pieces. This gives the effect of an extended and single work. Walt Whitman’s Leaves of Grass, with its long, democratic lines, is a clear precursor, but Rankine’s work exists in the more contemporary space of lyric essay as well. Rankine uses outside text and images to illuminate and complicate, such as the recurring quote from Zora Neale Hurtson, “I feel most colored when I am thrown against a sharp white background.” This text stands out most as a two-page reproduction of Glen Ligon’s rendering of the quote in black on a white background. Indeed, Hurston’s quote can be considered a sort of theses statement for the whole book. The most notorious of Serena’s detractors takes the form of Marina Alves, the distinguished tennis chair umpire. In 2004 Alves was excused from officiating any more matches on the final day of the US Open after she made five bad calls against Serena in her semifinal matchup against fellow American Jennifer Capriati. The serves and returns Alves called out were landing, stunningly unreturned by Capriati, inside the lines, no discerning eyesight needed. Comentators, spectators, television viewers, line judges, everyone could see the balls were good, everyone, apparently, except Alves. No one could understand what was happening. Though no one was saying anything explicitly about Serena’s black body, you are not the only viewer who thought it was getting in the way of Alves’s sight line. After reading Hum I asked if Poetry Can Save The World or, at the very least, ease your pain when the news of the world becomes too much. I ask both questions again now in the context of Citizen. Reading is an act of empathy, especially if the text you’re reading is in second person, as Citizen is. Can poetry like this save the world?